Adidas is one of the biggest sports apparel manufacturers in the world today. Star Wars is one of the most popular movie franchisees ever to have come out of Hollywood. When the two join forces, the result is a high fashion collectible that will certainly have a jaw-dropping effect on you. At first glance, it seems like a regular varsity jacket that will keep you warm and cozy in the coming winter months. The sleeves of the jacket are white in color while the body of the jacket is jet black. Allow your gaze to linger a little longer and you will fall in love with its chic, Star Wars inspired design. 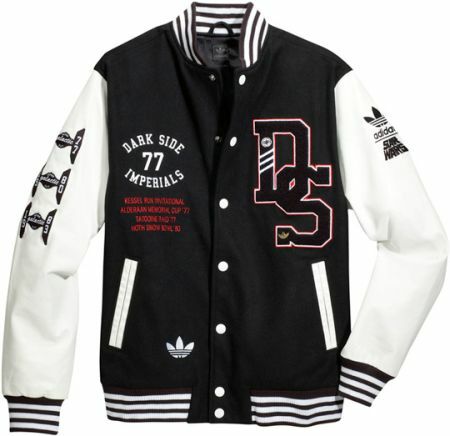 Sitting proudly on the right front panel of the jacket are the two letters, D and S. The two letters have a black color tone with white and red stripes running across its border. The letter S is placed in such a way that it hooks on to the letter D. There are no points for guessing what the D and S stand for: the Dark Side of the force. The ubiquitous varsity jacket is a classic American staple of team loyalty. 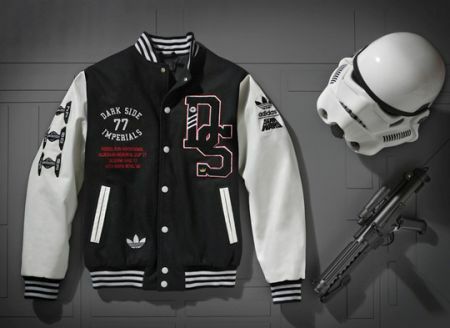 The Adidas/Star Wars varsity jacket makes a very clear indication of which side of the force they are on: the Dark Side. To further emphasize their allegiance, the jacket has ‘Dark Side Imperials’ stitched on – in white this time – with the numerical 77 in between the two letters. The jacket blends the traditional design of the varsity jacket with Star Wars characteristics by mentioning imaginary dates of football championships. We have the years 1977, 1980, and 1983 printed on the right hand sleeve of the jacket with imaginary trophy names such as ‘Hoth Snow Ball’. We have talked about the Star Wars inspired embroidery on the jacket. Time has come to talk about the design work that makes this jacket a must have piece of clothing. Stitched in big, bold design on the back of the jacket is the white- colored storm trooper helmet. Behind the helmet, a couple of space guns (and two twinkling stars) are placed in a crisscross design to give the robotic Stormtrooper the ultimate badass look. Accompanying the Stormtrooper and the space guns are the words ‘Super Death Star’ that frames the graphic image. 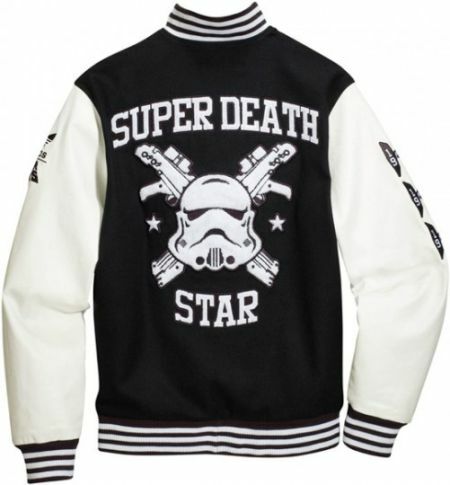 The ‘Super Death Star Storm trooper Varsity Jacket’ is part of Adidas originals Fall/Winter collection for 2010. You can also take a look at X Men Wolverine Jacket and Captain America Costume Hoodie to learn more about such jackets. How much? And can girls wear it too?